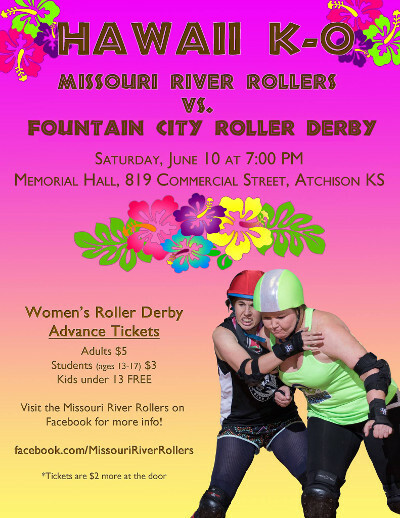 This Saturday night, the Missouri River Rollers of Atchison, Kansas take the track at Soldiers & Sailors Memorial Hall for their final bout of the 2017 season, and we’d love to see every Kansas City roller derby fan out there supporting them! And they’re taking on our hometown Fountain City Roller Derby, so there’s the added bonus of having your loyalties tested while you’re watching some of the best flat track action the Kansas City area has to offer. We at KC Derby Digest are big fans of these up-and-coming Missouri River Rollers, and we’re excited to see their inaugural season take off the way it has. We’re also massive fans of the ladies and gents from FCRD, so make the drive to Atchison this Saturday night and join us for a guaranteed good time. It’s Hawaiian-themed, and the afterparty will be at Willie’s Sports Club just down the street. Hawaii K-O begins at 7:00 Saturday night. Follow the link above for all the details. We will see you this weekend!